Paragliding is the most exhilarating and peaceful, simple, yet challenging form of aviation yet devised. The modern paraglider has opened up the skies to thousands of people from all walks of life, right across the globe. It is a sport that unites people's differences, giving them a unique common interest,to pursue mans oldest dream to fly like a bird. 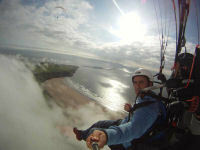 Paragliding is a sport that is very dependant on the weather as flying is only possible in certain conditions. A good flyable day is one where there is light wind and no rain. Clouds (except Cb) are not a problem; a dull overcast day with light winds can often be better than one in blazing sunshine. As the passenger your flight can be smooth and tranquil, or an exciting roller coaster ride! You choose. These flights are of an instructional nature and you will learn how a paragilder launches, lands and steers. We have some of the best flying sites in the country, and depending on the weather conditions for the day, you could fly from the Blorenge, in Abergavenny, Coity Mountain, or a ridge run from Pandy up into the Black mountains, Hay Bluff, each flight with stunning views. We also have one of our Tandem paragliding instructors based in Mid Wales, and sitess around Kington Builth Wells and the Long Mynd can also be flown. Sometimes a good westerly Breeze has us heading for the Gower Peninsular, and the magical site of Rhosilli. If the conditions are good you will get the chance to fly the paraglider yourself. Maximum passenger weight limit is 95kg. Please bring suitable outdoor clothes, boots and gloves. The right conditions for a tandem paragliding flight can sometimes be difficult to arrange, in terms of your availability coinciding with the right weather! So we ask you not to book one if you live more than 1.5 hours from Abergavenny. Please note: We are not able to take a booking on the basis of flying from a particular site. If you are booked in you will have to go from the best site for the conditions on that day. If you wish to fly from a particular site we will advise you the conditions required to fly it, and you will have to monitor our weather updates and book on the basis of the right forecast. Event takes place at Merthyr Tydfil in Glamorgan . The voucher will have Merthyr Tydfil printed on it, but it can be used from..